Posted on November 30, 2018 filed under Recent News. 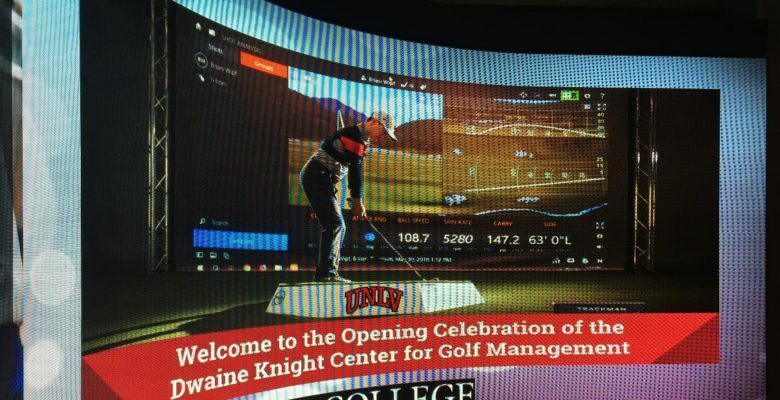 It was official when UNLV Hall of Fame head coach Dwaine Knight cut the ribbon for the new, state-of-the-art (and stunning) Dwaine Knight Center for Golf Management. Along with Harrah College of Hospitality (top-ranked college in nation) Stowe Shoemaker and UNLV professional golf management director Chris Cain, and other UNLV golf, UNLV supporters and players, Knight celebrated the official opening of the Center, which is already becoming a go-to spot for game improvement, buiding of camaraderie and educational opportunities. 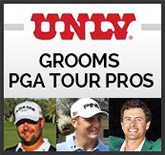 Keep checking back for more updates and video about this special evening and amazing Center that features state-of-the-art swing technology, large putting green, pro shop and much more.